Demand the removal of offensive billboard! I was driving down the A1A with my daughter when I saw the "Islam Bloody Islam, Doomed by Its Doctrine." billboard. I was horrified that something so hateful would be put up in my community. No one should be forced to see this offensive message on their way to work or school or just going about their day. We should always stand up for those in our community who are shown hatred and intolerance. This billboard is not representative of how the people in St. Augustine feel about our Muslim neighbors. It is of the utmost importance that we join together in standing against messages and movements that isolate, judge, and threaten an entire community of people who share our same hometown. 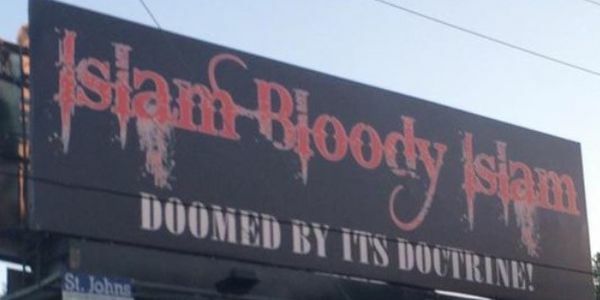 Please sign and share this petition to take down the offensive "Islam Bloody Islam, Doomed by Its Doctrine" billboard. Take down the offensive "Islam Bloody Islam, Doomed by Its Doctrine" billboard.